Once on This Island is a musical about a girl coming of age in the style and fashion of Ariel in Disney’s “Little Mermaid.” The folk tale with modern Caribbean-tinged grooves has a group of mischievous gods who teach the heroine about life. The show is filled with animated story telling, musical harmony, song and dance and the spirit of human goodness battling the accidents of fate! Spotlight’s professional artistic team directs Staten Island youth performers who bring this pop/rock/soul musical to families and friends of all ages. 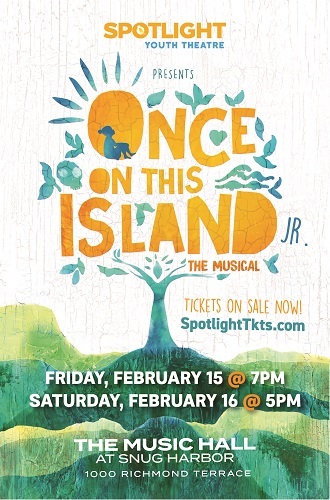 Spotlight Theatre’s production of Once on This Island follows the smash hit revival that just completed its Broadway run. Posted on February 5, 2019 .